Home > Testimonials > Mark & Monica D.
Working with Matt Hanson and everyone at Tahoe Truckee Homes has been a wonderful experience! Our circumstances required the timely sale of a cabin we truly loved and spent years renovating ourselves. 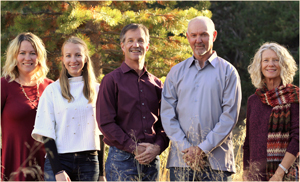 When we decided to sell our cabin, we sought an agent who was experienced with the real estate industry and knowledgable in the Lake Tahoe and Donner Summit markets. We also hoped to find someone who would appreciate our asset and help us price it appropriately. We were thrilled to be referred to Matt by Jennifer Boehm who we had the good fortune of working with to purchase the cabin 8 years earlier. Matt helped us navigate through every step of the process with expert advice and great care. He is extremely thorough, professional, and detail-oriented. Throughout the entire transaction Matt was proactive and prepared for everything that arose. He was skillful at managing all negotiations and the escrow period as well, and was constantly looking out for our best interest while ensuring everything proceeded smoothly. We are glad to know him as he is a genuinely kind and sincere person who is an absolute pleasure to work with.